As you take a walkthrough of the Press Club, you see ‘scarred faces’ screaming out at you from their frozen frames, from Shirish Shete’s frames in his show titled ‘Scarface’. A veteran media photographer, who has been with the Press Trust of India for over two decades now, Shirish Shete has been dedicatedly shooting acid victim survivors for over half a decade. India records the highest cases of acid attacks in the world with the worst conviction rates. As is often the case with other crimes against women, acid attacks victims are treated with official apathy and societal indifference. The victims are usually women aged between fourteen and thirty-five, and the attacks often the result of rejection of a marriage proposal or sexual advances; unable to bring enough dowry; for bearing a female child; for professional rivalry; for as petty a thing as having cooked a bad meal, so on and so forth. Often at times, men are also not spared from acid attacks. The Chief Guests for the occasion were philanthropist Dr. Aneel Kashi Murarka who graced the evening with a group of acid attack survivors, supported by his organization Ample Missiion and Megha Patil, Ex Vice Chairperson of Mahila Arthik Vikas Mahamandal, Govt. of Maharashtra, Ex Member of State & Central Govt. Committee on Equal Remuneration For Women & Governing Council Member of Maharashtra United Nations Association. “Nobody even wants to be next to them. These stories are not stories people want to hear. A photograph speaks a thousand words and with the right caption or accompanying the right story, it sensitizes society and raises questions. As a photojournalist, I’d be happy to have contributed in anyway whatsoever,” concluded Shirsh Shete. On the occasion, the cover of Tezaab Tales, a coffee table book that highlights the alkaline truth behind the acid attack victims' lives. 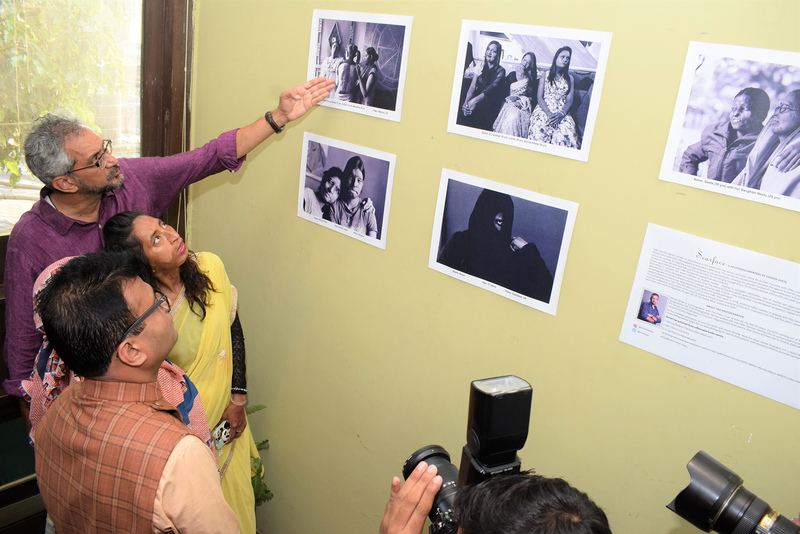 The photo documentary is by Shirish Shete, the text by Anusha Srinivasan Iyer and is being published by philanthropist Dr. Aneel Kashi Murarka of Ample Missiion. Shirish Shete, who is currently designated as the Chief Photographer with The Press Trust of India, has earlier worked with The Indian Express and Mid-Day, contributed to various magazines like Femina and Debonair among others; has travelled extensively around the globe with the Indian PM Narendra Modi, former Indian President APJ Abdul Kalam, former Indian PM Manmohan Singh on their work tours and has previously exhibited in various galleries across India.